Get wet and roar with the joy in the 3.8 hectares adventure park in the middle of the tourist attraction. 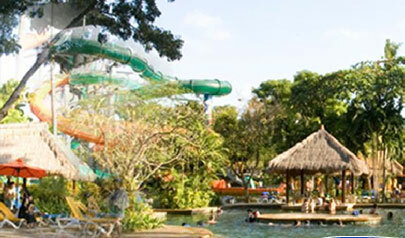 The Waterbom Bali with world class waterslides in a first class environment is the only water park in Bali. Waterbom has racing slides and totally tubular tubes for pure thrills and spills. There are leisurely water rides for pure relaxation. With more than a kilometer of moving water in eight different attractions, there s something for everyone. Complete facilities include restaurants, bars, entertainment, a spa. sports courts and a kiddy park. Everything is set among fabulously landscaped gardens, tastefully integrated into the surrounding landscape to satisfy the most discerning traveler. Ready to WOA-AAAHHH!!? Hit a top speed of 70 km per hour as you smash straight down from a 8-storey slide at a 60-degree angle. Hey braveheart, don’t close your eyes! Phew! Here's a river you can drift along in a tube raft and lull your heart-rate back to normal. Cascading waterfalls, languid ripples, and event luxuriant tropical foliage to screen you from the flurry of excitement. A thrilling swoosh down the Aquatube picks up momentum as you get pulled through the enclosed slide at breathtaking speed. Emerge from the tunnel into a huge cauldron otherwise known as the SUPERBOWL! From here, you get flushed down for a splash into the pool. Big fun for little ones - twisting rides, body slides, water jets and more for tots to go ecstatic! Relax, mum! This park is designed child-safe and supervised at all times! Main Restaurant - When you've worked up and appetite, head for the main restaurant Western, Classic, Asian Eclectic and Italian fare in relaxed. Seats 80 guests. GIT (Group Independent Travelers) is defined as fifteen (15) peolple, or more per reservation. Bona fide tour leader/guide (I.D. required) shall be admitted complimentary. The admission gives access to all the park except the towel, locker, Euro Bungy, Spa, Water Blaster, Climbing Wall and Cabana rental service which are available to extra charge. 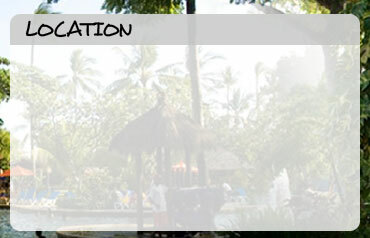 Any amendments to this aggreement shall not be valid until agreed in writing by authorized Waterbom Bali personnel.